The annual conference takes place this year from 11th – 13th of June in Chicago, USA and the exhibition floor is open on June 12th and June 13th. 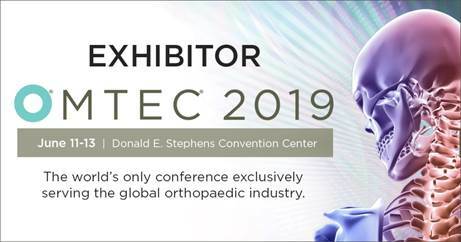 As a long term supplier of choice for many orthopaedic companies CAM is pleased to be present at the OMTEC to engage with current & potential clients. Please come and visit us at booth # 251, where we will display our service and product portfolio. We also would like to invite you to join our In-booth presentation at the OMTEC, scheduled for Thursday, June 13, 2019 at 9:40 am. Title: Manufacturing and Chemical, Physical and Biological Characterization of Innovative CaP-based Materials for Bone Repair.